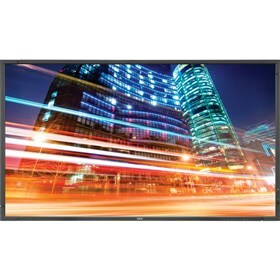 The NEC P553-PC is a bundled solution that includes 55” LED backlit professional-gradelarge screen display with integrated computer. This display has 1920 x 1080 resolution that displays incredibly clear imagery and also features NaViSet software solution. The integrated Computer is powered by the 1.8 GHz Intel Dual-Core Atom Processor, NVIDIA ION2 graphics processor, and 2GB DDR3 RAM. It includes 4 USB 2.0 ports, 250GB hard drive, Windows 7 Standard Embedded OS, and DisplayPort output. The P553-PC is equipped with Smart sensing technology that automatically detects your work conditions to determine proper display brightness with ambient light sensor. The Input Switching Speed between source transitions minimizes downtime. This monitor has 178° horizontal and vertical viewing angles and brightness of 700cd/m2. The NEC P553-PC has many exciting features for users of all types. See the NEC P553-PC gallery images above for more product views. The NEC P553-PC is sold as a Brand New Unopened Item.